In Lexi's world, no one is given a fair trial. You're accused of a crime and branded a sinner, and there is only one place where sinners are taken to rot, the looming concrete walls of The Hole. Assigned a guard for protection, Lexi's brand makes her a target, lust. Lexi is put to work at the hospital, meeting the kind and gentle doctor Sutton. Sutton is everything the oppressive regime is not, taking Lexi under his wing. Many of the patients are gravely ill, none more so than thirteen year old Alyssa. The terminal virus that is killing her, only leaves the wise beyond her years teen, with weeks to live. Cole has orders to guard the newly branded inmate with the turquoise coloured eyes. Cole isn't cruel like other guards, working under the unjust, unforgiving regime of The Commander. In their world, guards are to be feared and being accused of a crime never goes unpunished, even if the accused is innocent. With trusted guard dog Zeus, Cole protects Lexi with his life. Guards are forbidden to pursue any form of relationships, and falling in love with a sinner of lust is punishable by death. But he can't walk away. As the violent streets worsen, pitting Hole residents against guards, it seem the revolt I'd imminent. With her father dead, her brother who left her and the hate she carries for her mother, all Lexi has is Cole and father figure Sutton. There is more to Lexi's new family that she ever thought possible, it seems a change is coming. Lexi will fight for Alyssa, for those wrongly accused, to love Cole freely, to see the hatred and violence end, and for herself... The strong young woman she has become. 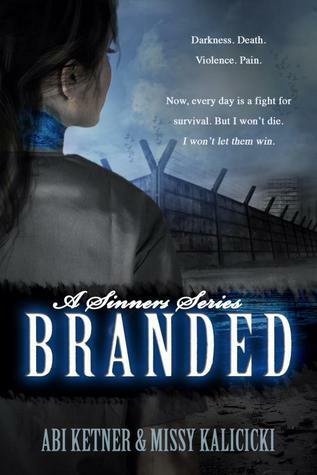 I was utterly swept up in Branded from the very first page. I salivate over dystopian novels with oppressive regimes, leading to revolutions, and Branded is one you simply won't be able to put down. Lexi is a bright young woman, who's tragic past has left her broken, a shell of her former self when her father was alive. It isn't until she meets Cole and forms a forbidden and strong attachment, where she starts to finally live again. Well paced and gritty, fans of Shatter Me will see the similarities between the main protagonists. Abi Ketner and Melissa Kalicicki are a formidable team, the story flows seamlessly and the the plot twists, you'll never see coming. Really enjoyed it.